A great egret walks slowly and peers into shallow water until it spots a small fish to grab or stab with its beak. Great egrets often appear on the shores of Mill Pond from mid-August through late September, passing through on their way south. Their brilliant white makes them easy to spot. As summer draws to a close, look for occasional large, bright white birds on the shores or in the shallows of Westborough’s ponds. As these white silhouettes haunt the shorelines, they look like ghosts of the great blue herons that used to nest in the dead trees in Mill Pond and still hunt in the shallows there. The two kinds of wading bird have a similar “Big Bird” shape – long neck, long legs, long beak – and a similar style of hunting fish. They stand very still or walk very slowly and peer into shallow water until an unsuspecting fish swims near. Then, with a lightning-quick strike, they grab it or stab it with their beak. But no, these big birds in white are not ghosts of our great blue herons. Rather, they’re relatives – great egrets (Ardea alba). 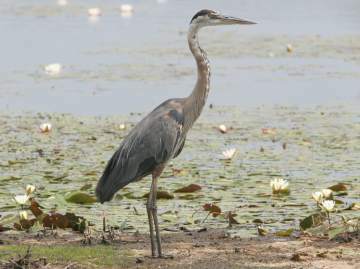 They’re actually smaller than great blue herons (Ardea herodias), standing just over 3 feet tall versus just over 4 feet for the herons. They also tend to catch smaller fish. What are they doing here all of sudden? From mid-August through the end of September, they pass through as they migrate south for the winter. The shallow waters near the shores of Mill Pond and other local ponds offer good fishing for them. Great egrets have a special claim to fame as the emblem of the National Audubon Society. This honor is due to their unhappy role in launching the bird conservation movement more than a hundred years ago. Back in the late 19th century, when feathers were high fashion for ladies’ hats in the U.S. and Europe, the long fancy plumes that great egrets sport in the breeding season were highly prized. The fashions led to the wholesale slaughter of great egrets and other birds. Plume hunters would wipe out entire colonies of nesting birds. 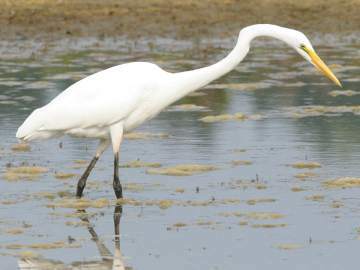 More than 95 percent of the great egrets in the U.S. were killed. In 1887, some Smith College women started an outcry against the ladies’ fashions that encouraged the slaughter. They established a Smith College Audubon Society in 1887. Then in 1896 some Boston women established the Massachusetts Audubon Society to discourage the wearing of feathers and encourage the protection of birds. The bird conservation movement spread and grew. It led to the 1910 Audubon Plumage Act, which banned commercial traffic in plumes of native birds, and the 1918 Migratory Bird Treaty Act, which still prohibits the killing of native birds that aren’t game species in the U.S. and Canada. Great blue herons are close relatives of great egrets. A colony nested in the dead trees in Mill Pond for decades, until the last branches finally came down a few years ago. Great blue herons still stalk fish in the shallows of Westborough’s ponds between April and October, but their blue-gray colors make them hard to spot. A scene with a great egret standing patiently near shore seems like such a peaceful scene, but are these birds really peaceable creatures? In their young life as chicks in the nest, sibling rivalry is often a matter of life and death. The fighting over food can be vicious as the egret chicks turn on each other with the stabbing and jabbing moves that they will later use to hunt fish. The losers in this early life struggle either starve to death or are killed by stronger nest-mates. The parent birds routinely stand by as the number of chicks in the nest gets reduced from three (or occasionally more) to one or two through siblicide – the killing of a sibling. What makes egret chicks behave so viciously? Is it nature (something inherited in their genes) or nurture (something in their upbringing)? There is a case to be made for both genes and upbringing, and both probably play a role. On the upbringing side, egrets lay their eggs over a period of several days, as most birds do. But unlike most other birds (except birds of prey), egrets start incubating when the first egg is laid, instead of waiting until all have been laid. What does this mean? Rather than hatching all at the same time, the chicks hatch over a period of days, giving the first chicks out a head start in growing bigger and stronger. The older chicks are then better able to compete for the food that the parents bring to the nest, and they’re better suited to bully and even kill weaker, younger chicks. Also on the upbringing side, the size of the food that the parents bring seems to influence the way the chicks behave toward siblings. Great egret parents provide small, minnow-sized fish that are small enough for one chick to keep for itself. The small fish is a prize to fight over. In contrast, their close relatives, the great blue herons, bring back larger fish that are too big for one chick to hog – and in great blue heron nests, siblings don’t kill one another. When researchers tried raising great blue heron chicks like egrets – by putting them in egret nests where parents supply small fish – they found that the heron chicks acted just like egret chicks. They fought and killed weaker siblings. Yet genes probably also play a role in how the great egret chicks behave. Researchers have tried raising egret chicks like heron chicks, by putting them in great blue heron nests where the parents bring large fish and sibling relations are more peaceful. Even in the heron nests, the great egret chicks killed siblings, just as they do in egret nests. Their combative instincts run deep. Great egrets are found around the world. They nest in coastal areas of North America and winter on the southern coasts of the U.S. and in Mexico, Central America, and South America. They’re also found in Europe, Asia, parts of Africa, and New Zealand. If you’re lucky enough to see a great egret this season, enjoy their beauty and think of them as survivors. Not only have their populations recovered from the rampant plume hunting that endangered them a century ago, but the individuals that you see may also have fought and even killed to survive as chicks in the nest. They remind us how strange and beautiful nature can be!